Before Christmas, I was contacted by the team at Curvissa to see if there was anything I wanted to try from their Spring 2013 collection. I picked out some shoes and then completely forgot all about them as I didn’t hear back for quite some time. A few weeks ago, I had a mystery package arrive. I love it when that happens – something unexpected arrives and it’s really exciting opening the box and finding out what it contains. Luckily for me, my surprise parcel contained these lovely Leather Platform Court Shoes by Tamaris. I chose these shoes because they are described as wide fit and I wanted some brown shoes to match with my brown clothing (of which, admittedly, I don’t have a huge amount, but I needed something to wear with, nonetheless). I went for a size 6 and that was absolutely spot on. The width of the shoes was not good enough for me, unfortunately, and I found them rather tight. Rather bizarrely they also slipped off my feet when walking, but that’s something that happens to me quite a lot with this shape of shoe so it’s probably more down to my silly feet than the shoes themselves! The shoes have a small platform of around 1cm and an anti-shock heel. What on earth does that mean? Well, I wore these shoes around the house for an hour or so and I found them to be very comfortable and the heel did not send shockwaves up my spine, like some heeled shoes do. So I guess there is something in the heel or perhaps it’s what the heel is made from to make for a more comfortable, lower impact walking experience. 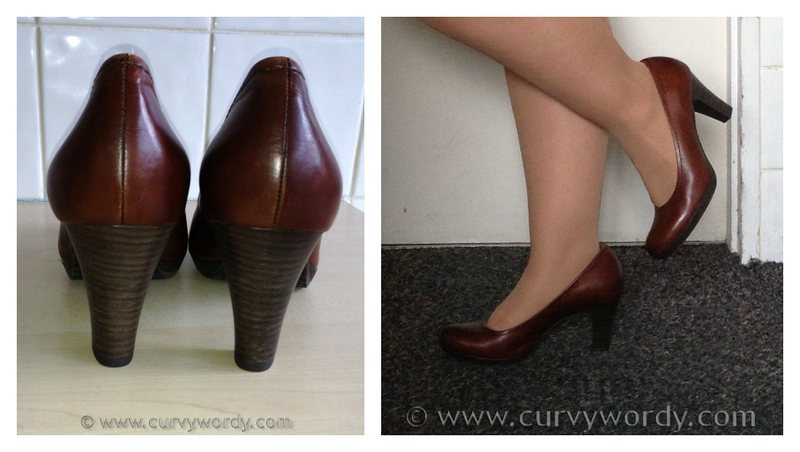 I was so impressed with the lovely quality leather that’s been used for these shoes. It’s so soft and flexible – I am wondering if they might even stretch out with wear and shoe stretchers in order to fit my overly wide feet. The shoes work brilliantly with this outfit! I have found it hard to find shoes and accessories to match with this dress as it seems wrong to introduce black when there are already three colours – rust, white and navy. Now, I know these shoes are brown and not rust, but I think the brown is a darker shade of rust and so the shoes do not look out of place when worn with this dress. At £59, the Curvissa Leather Platform Court Shoes by Tamaris are not cheap, but the quality and comfort they offer make them well worth every penny! They’re also available in black. 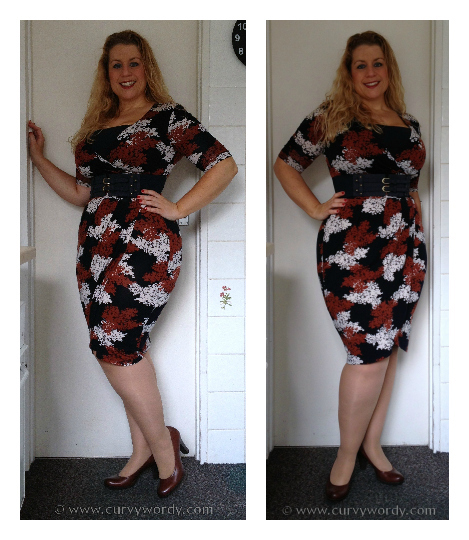 Next Post F&F Clothing Julia Animal Print Gold Ring Wrap Dress…AND GIVEAWAY! The shoes and the outfit are really really cute. Something about the round toe and heel height comb really works.